Design: Leslie Bennett (); Stefani Bittner and Christian Cobbs (). 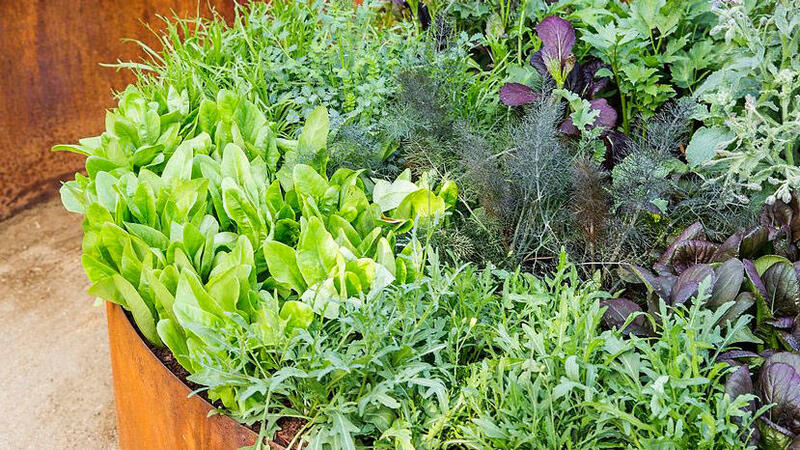 Curving raised beds overflow with fragrant herbs, clusters of huckleberries, deep purple mustard, and fresh lettuces in this high-style edible retreat. 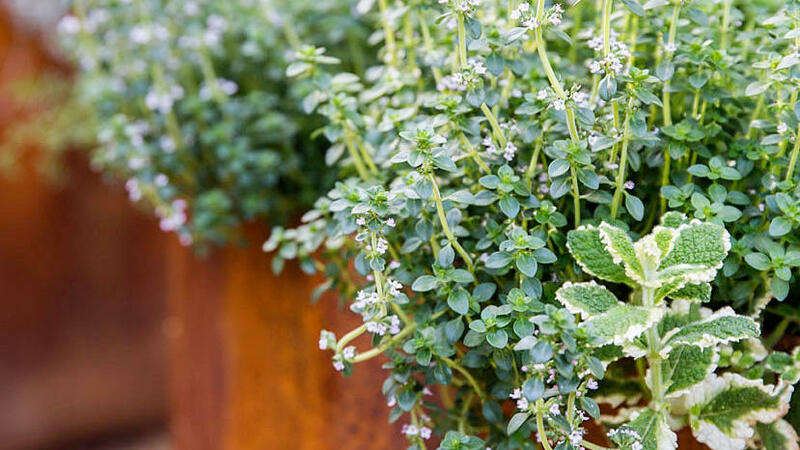 Swap annuals for less-thirsty perennial edibles, even if it means finding unusual varieties like evergreen huckleberries—“blueberries’ low-water cousin,” says Bittner. Other picks are edible bamboo, (which they used to form a hedge), pomegranates, and evergreen pineapple guavas. Stave off a chaotic look by sticking to a color palette. 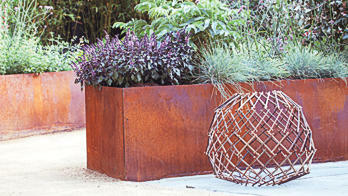 The team kept their plants in shades of purple, silver, and green, with a touch of orange and red. 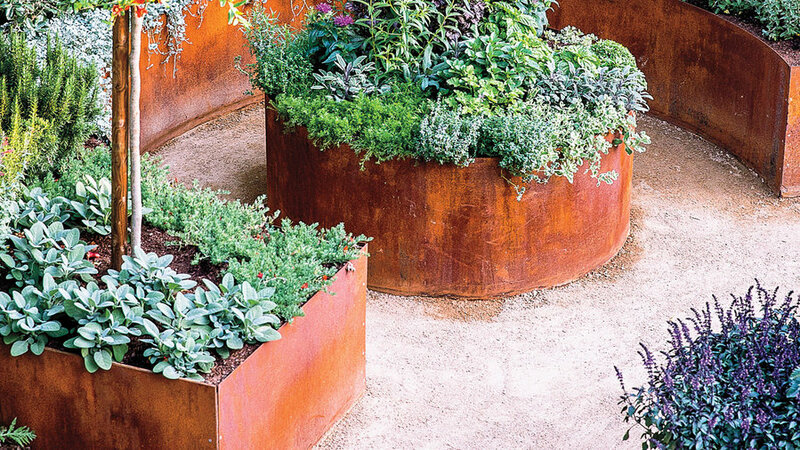 “You can have almost anything in a garden that has crisp, clean hardscaping,” Cobbs says. 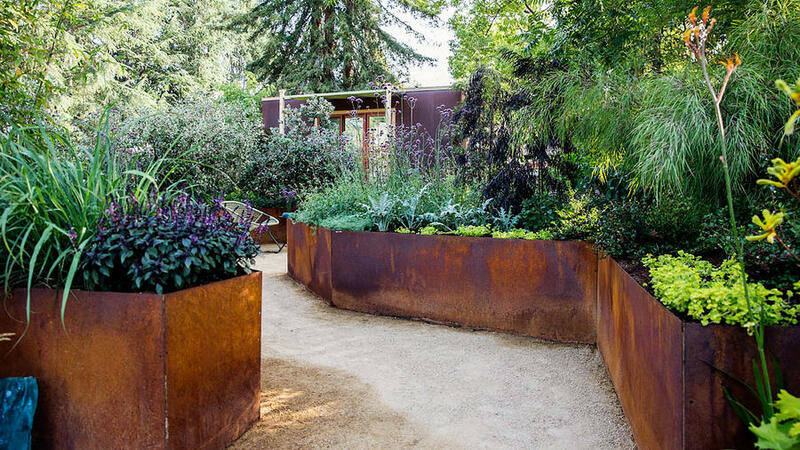 They created 24-inch-high planting beds out of food-safe Cor-ten steel. Decomposed granite forms the paths. Your arm’s reach is a handy measuring tool. Any bed you’ll harvest from should be narrow enough to reach what’s planted in the middle. 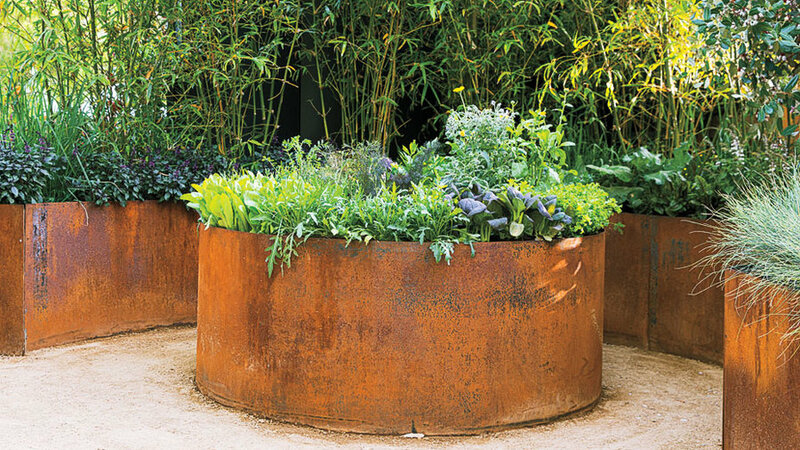 Dividing planters by use—such as this circular bed of salad greens—and keeping edibles within arm’s reach makes harvesting a cinch. Along the back of the bed, bamboo provides screening as well as edible shoots. Plant something fragrant like purple magic basil where you’ll brush against it. Mix herbs such as basil, variegated sage, and dark purple shiso with edible flowers like magenta-colored bee balm. The flowers add color and attract pollinators to the garden. 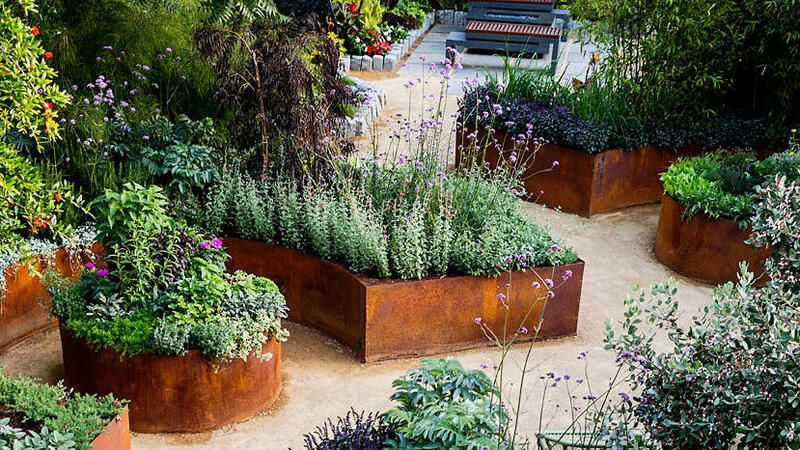 Plant edibles in food-safe materials: wood, stone, inert metal. 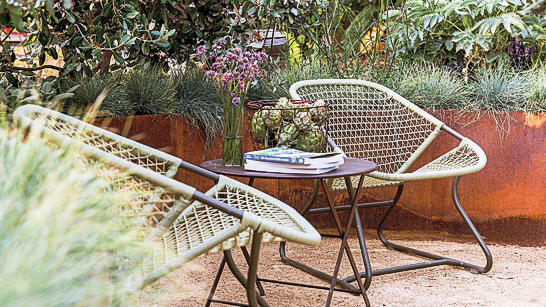 A pair of chairs tucked in a curve of the planter creates a place to rest in the garden between harvesting. 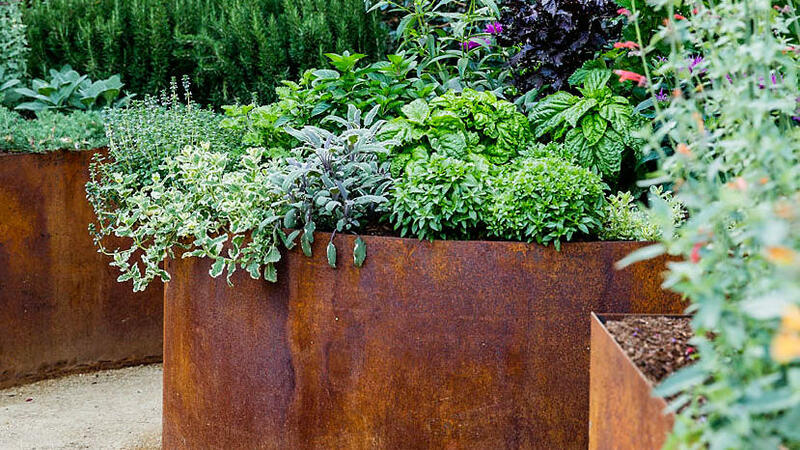 Cool tones of blue fescue soften the edges of metal beds and pick up the silver leaf color of the edible pineapple guava (Feijoa sellowiana), used as a hedge.